Kiyosen was built in 1965. There was a bathroom on the ground floor and a meeting place managed by the residents’ association on the second floor. In July of 2016, that building was renovated as a hot spring filled with a good hospitality for various people can visit pleasantly. Hot water”Atsuyu” and tepid water”Nuruyu” are provided so you can take a bath as your condition. 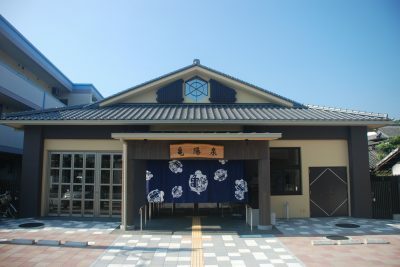 In addition, Kiyosen equips with the facility that an easy-to-use hot spring even for elderly people and those with disabilities. There is also a multipurpose hall that can be used for various purposes. You can see the design which made the motif of the turtle shell seen all over. Kiyousen is written “亀洋泉” in Japanese. “亀” stands for turtle.